Os bons tempos da Guerra Fria voltaram! Tá bom, sei que é muita empolgação, mas a política externa russa está cada vez mais parecida com a soviética (foi diferente algum dia? sim, no final da era Gorbachev e nos anos Ieltsin). 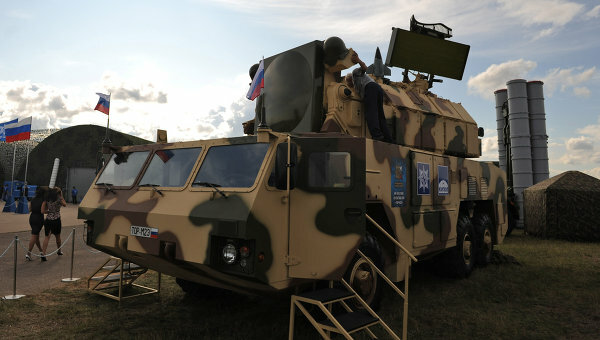 Russia will continue deliveries of Tor-M2 air defense systems to Belarus in 2012, Defense Minister Anatoly Serdyukov said on Wednesday. The Tor-M2 (SA-15 Gauntlet) is a low- to medium-altitude, short-range surface-to-air missile system designed for intercepting aircraft, cruise missiles, precision guided munitions, unmanned aerial vehicles and ballistic targets. “We will continue the deliveries of Tor-M2 air defense systems to Belarus on preferential terms,” Serdyukov said at a meeting of the Russian and Belarusian senior military officials in Minsk. The Russian-made systems are being deployed in the 120th Missile Brigade in western Belarus. Minsk is planning to have a full-size air defense battalion equipped with Tor-M2 systems by late 2013. The first Tor-M2 battery was delivered at the end of 2011. Russia is looking for ways to counter the potential threat to its national security from the European missile defense system whose elements are being placed close to the Russian borders. Moscow and Minsk signed an agreement on the joint protection of the Russia-Belarus Union State’s airspace and the creation of an integrated regional air defense network in February 2009. The network is expected to comprise five Air Force units, 10 air defense units, five technical service and support units and one electronic warfare unit. Esse post foi publicado em Assuntos Internacionais, Defesa, Rússia/União Soviética e marcado Bielorussia, escudo anti-mísseis, Guerra Fria por Joanisval. Guardar link permanente.